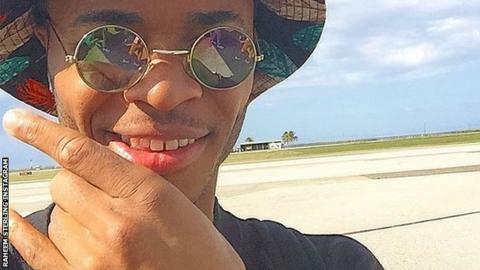 Liverpool's Raheem Sterling missed his side's Premier League win at Sunderland on Saturday as he soaked up the sun in Jamaica. He posted a picture online of himself wearing sunglasses and a floppy sunhat. Liverpool boss Brendan Rodgers said he had "always planned" to give the 20-year-old - who has played more minutes than any other outfield player in the Premier League this season - a break. Liverpool beat Sunderland 1-0 despite six other players being ruled out. "For me, it was the right thing to do for Raheem," Rodgers told the BBC after Liverpool's win at the Stadium of Light. "He's a very talented young player and we ask a lot of him. "He's one of those little robust players but he's played a lot of football, not just this season but over a couple of years since he's come into the team. Internationally as well, there's been a big demand on him. "Of course, as a manager you can absolutely maximise everything out but when you get to the last 10 games of the season he might be running on empty." Sterling has made 34 appearances for club and country this season and Rodgers added: "If I was being selfish I would have him in every game but I hope that he can play at this level for the next 10 years - he has to have that breathing space." Earlier in the season, the forward was left out of the starting line-up for England's European Championship qualifier against Estonia after complaining of fatigue on the eve of the match. Rodgers had earlier told the Liverpool Echo that Sterling's mid-season break "was always in the plan". He was also given permission to miss the 2-1 FA Cup third round victory against AFC Wimbledon on Monday. Sterling is set to return to training next week ahead of the Premier League match against Aston Villa. Speaking before the game against Sunderland on Football Focus, former Liverpool defender and BBC pundit Mark Lawrenson had questioned the decision. "By all means leave him out of the cup tie against a lower division side," he said. "But, they are chasing a Champions League place, so I think he should be playing." Fellow pundit Martin Keown added: "He's entitled to a rest, but I don't think it sends out the right message letting him go abroad."